As you'll have seen in yesterday's post, we are now testing the Graco Evo Mini. When the delivery man knocked on my door I could have kissed him I was so happy. Straight away I opened the box to piece it together. I was pleasantly surprised to find that it came with only a few steps needed to put it together. The contents of the box consisted of; the chassis (with seat unit already attached), hood, rear wheels, front wheel and raincover. 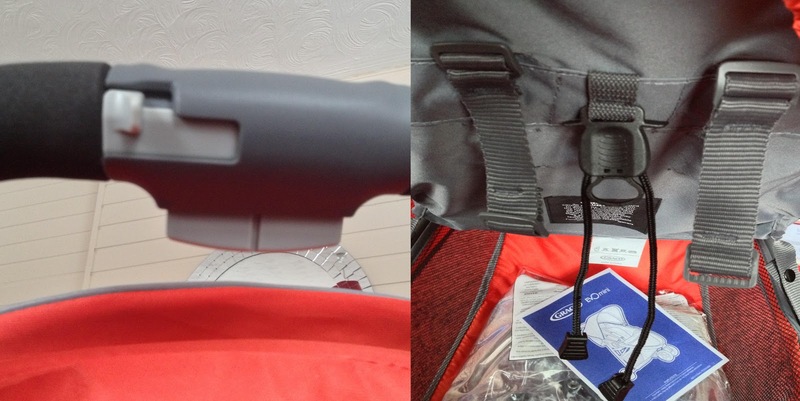 It was very simple to put together compared to all my previous pushchairs. You just open up the frame, attach the back wheels by just simply clicking them onto the frame. click on the front wheel which goes on as easy as the rear wheels. The hood also just clicks into place on the chassis and has poppers that help attach it to the seat unit to keep it in place. Also the basket is attached to the chassis already but you need to attach the back of the basket to the bar, again just by fastening poppers clicking it into place. That was it! and it took me about 5 minutes! The pushchair has a very easy one-handed fold and I have tested this out holding Zach in one hand and folding it down with the other with no problems. There are two buttons in the centre of the handle; a small one that you pull to the right (which can be done with just your thumb) and a big long one that you pull inwards with your remaining fingers at the same time. once both of these are pressed together the pushchair collapses into itself. It is also very easy to recline, the toggle system looks complicated but after looking at the instructions I felt very silly. To sit it upright you pull the two loose toggles outwards and to recline again you pull the ring in the centre (see picture above). One thing that wasn't so easy was adjusting the chest straps. They come on the smallest setting meaning that if you want to put an older baby in the pushchair you need to completely remove the strap from the bottom hole and put it back in one of the higher ones. As the seat is quite padded it was quite fiddly to do although I did still manage it without getting too angry! The seat looks lovely and comfy with it's padded seat, which is usually a big problem with strollers. 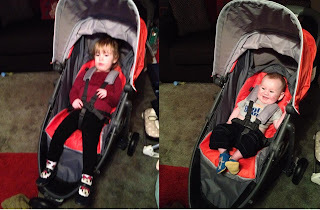 What's even better is that both kids fit in it comfortably. Gracie is 27 months and weighs 13kg. She is very tall for her age but as you can see she fits perfectly. Zach is 6 months and weighs 7.6kg and also fits in perfectly without leaning to the side thanks to the support from the cushioned seat. The seat can be fully reclined for Zach which is great as he still naps in his pushchair regularly and while the seat is reclined fully the basket is still fully accessible so there is no need to lift the seat to fit shopping in the basket. The basket is an excellent size for a stroller, much bigger than I expected it to be. I was sent the pushchair featured in this post free of charge for review but all views and opinions are my own. Proud Mummy Moment! Little mans first wave!